Your Personal Financial BluePrint™ plan is built on our client’s unique personal needs. 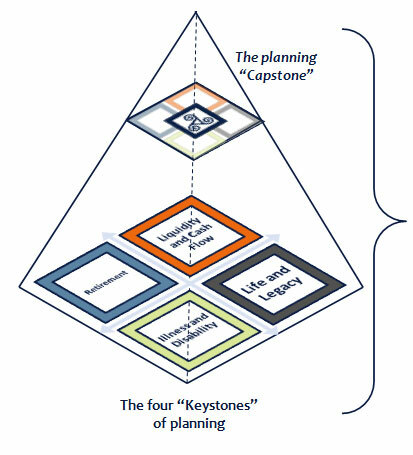 In order to best serve these goals and customize your personal BluePrint™ for you, we address four “keystones” sheltered by a “planning capstone”. It is the blend of these which covers all areas of your financial life. Clarify your present situation: collecting & assessing all relevant financial or medical data. Identify both financial and personal goals and objectives: these help us in customizing your BluePrint™ to you, and your personal situation. Implementing the right strategy: we help you implement our guidance and recommendations. In some cases this may involve other professionals such as your lawyer, accountant or advisor. Finally, we require periodic review and revision of the plan, ensuring your goals are met.